My order was received extremely promptly, and I am very happy with my order. The minties were a nice touch! 4-Port HDMI Switcher + FREE SHIPPING! 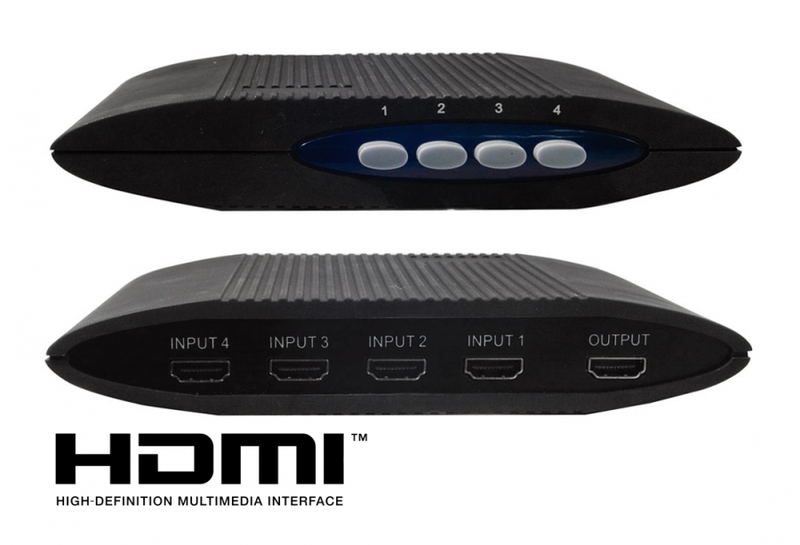 A great value passive 4-Port HDMI Switcher! Stylish 4-Port HDMI Passive Switch Box – Essential tech! This manual HDMI Switcher lets you select between up to 4 x HDMI source devices to display on a single TV (one at a time), or switch a single HDMI source device between up to four TVs (one at a time). Plus, this passive HDMI switch is a Apple TV & Foxtel Compatible HDMI Switch. It's all well and good to have a brilliant home theatre set up in your lounge room - but sometimes we can't be there to babysit it when the kids want to plug in their friends' games console or a relative needs to hook up their camcorder. Who wants to spend half an hour trying to set things right again after all the cables have been pulled out and swapped around at random? That's when you need a simple Passive HDMI switch. At the push of a button, you can toggle between several devices on the one television, allowing for even the most foolproof of component switching without the risk of trial-and-error cable play. To top it off, this device offers bi-directional switching, allowing you to toggle one input between four outputs, or four inputs to one output (one at a time). It's the easiest way to expand the number of inputs HDMI on your TV or Home Theatre Receiver without adding another remote control to your already well-stocked arsenal. Switch or Splitter? A HDMI Switch is needed when you only have one display (eg: your TV), and you have multiple devices to connect. Implementing a switch into your setup will let you connect these multiple devices to the switch, then select which one will be displayed. A HDMI Splitter on the other hand, is needed for when you have one device, which would wish to display (duplicate) to multiple displays. Should you need the advanced function of connecting multiple devices to multiple displays (many inputs, to many outputs), then you'll need a HDMI Matrix Switch. Passive (Manual) Switching vs Powered Switching? We refer to any Switch which is not powered (by USB or a power plug connected to the wall) as a 'Passive' or 'Manual' switch. These Passive Switches a great for compatibility because there's no re-processing of the HDMI signal. The switch selects an input manually, simply passing on the original HDMI signal to a new set of wires. Simple operation, 100% compatibility and cost can be advantages of Passive Switches, but they can suffer loss of signal strength and as such may not work with longer HDMI cables (cables up to 5m are recommended for best results). Additionally, they generally do not include remote control operation as this requires power. What about 'Passive' HDMI Splitters? Due to the amount of power required to duplicate a HDMI signal to multi screens, Passive HDMI Splitters are very unreliable, and so generally all HDMI Splitters must be powered. 4K Test: This switch can handle 3840x2160 Ultra HD 4K at 30Hz, but the bandwidth loss through the switch limits the total cable length to under 5 metres when using quality cables, and can reduce it as low at 3 or 4 metres under stressful conditions. Because this is a mechanical switch, it is FULLY COMPATIBLE with AppleTV and Foxtel switching to view your programmes on different TVs (one screen at a time)! Answer: "Passive means there are no powered components inside. The switch is purely mechanical, using copper to copper connections for direct data pass-through." Answer: "This switcher only links one input/output at a time. It does not split the signal for multiple TVs simultaneously." Answer: "Yes, this switch works backwards and forwards. For your application, the DVD player would connect to the socket labelled 'OUTPUT' and your TV and Projector would plug into 'INPUT 1' and 'INPUT 2'. Because this is a mechanical switch, it has no trouble working this way." Answer: "Yes. This switcher is totally transparent, and does not process the HDMI signal or EDID handshakes. It's just like manually swapping cables - the Foxtel, Chromecast and Blu-Ray devices will only ever 'see' the display, so there's no compatibility problems with any source devices for 2D 1080p content." Answer: "Yes, this will expand the number of HDMI sockets available on your TV. To change between connected devices, you just have to push the button which corresponds to the one you want to see on screen. The switcher does the job of 'swapping cables' at the push of a button." Answer: "That would be a 30 metre run of cable without any boosting ability, which is not likely to succeed in most scenarios using regular HDMI leads. For most runs over 20 metres, we recommend a powered switch or splitter such as product SW1103 or SP1122." Answer: "There is no facility for connecting power to this switcher. It can only accept and pass through HDMI cable connections." Answer: "This switcher is the push-button equivalent of swapping cables over - it does not split the HDMI signal, and none of our products can 'get around' HDCP. It may be useful in terms of making it easy to choose whether or not the capture card is looped in so you can disable it for watching Blu-ray, but enable it for gaming." Can you please send me the width and height of the box so I can check it will fit the space I have. Answer: "This unit measures 185mm (w) x 130mm (d) x 35mm (h)"
Answer: "No. This allows one TV to show Foxtel at a time. For simultaneous multi-room playback, please contact Foxtel for a second box subscription." Answer: "Yes! That way, each device will become available when its corresponding button is pushed, with its data being transferred to the projector in the same manner as swapping cables." Answer: "This Switcher has no powered elements of any kind. Only the position of the push-buttons reveals which input is selected. The function of this switch is the same as disconnecting and reconnecting a cable - if the Foxtel and Apple TV units hot-swap adequately when the cables are manually changed, then this switch will offer a push-button solution to the same task, and pass the signals through the same way. Ie: Any source devices not actively selected will no longer 'see' the TV." Answer: "Absolutely not. Nickel silver and 24k gold are used interchangeably in plugs and sockets, with both offering good electrical conductivity and high corrosion resistance. There are no side effects or chemical interactions when these metals meet, so it's perfectly safe to connect them up. It's even common to see electronics which use nickel silver plating for the plug chassis and gold plating on the actual contacts - with no problems even in the long term." Answer: "Yes it is compatible with Foxtel IQ3"
Answer: "Check out produce code SW1104 - it's a 4-port switcher with remote control. Unfortunately any switch with a remote control needs power from the wall, and contains chipsets which may not play nicely with Foxtel or Apple TV, etc." Answer: "It sure will. Simply connect a HDMI cable from the PS4 HDMI out to one of the four available HDMI inputs on the switcher. As the unit is passive and purely mechanical you won't have any issues with HDCP." Answer: "Yes. To use the switcher 'backwards' simply attach the displays to the Inputs and the source device (Satellite) to the Output. The mechanical nature of the switch will allow the connections to work in the same manner as swapping cables would." Answer: "Absolutely! You may also consider a remote-controlled switch for extra convenience (product code SW1103), but either option will work to expand the available HDMI inputs on your TV." Answer: "This switch can handle 3840x2160 Ultra HD 4K at 30Hz, but the total cable length must be under 5 metres even when using quality cables, and may need to be as short as 3 or 4 metres under stressful conditions." Answer: "Yes, that's correct. You'd effectively have 7 x HDMI ports in total." Answer: "Absolutely. The device is a simple passive HDMI switch allowing you to 'switch' between the desired source you wish to view on the TV." Hi, I want to be able to switch apple TV and a digital set top box. Can this be done ? Answer: "Yes, this HDMI switch will work with Apple TV and your STB." Is this compatible with Foxtel IQ3 box? Answer: "Yes, it is compatible with IQ3. Being a mechanical/passive HDMI switch it simply passes through HDMI signals." Very happy with your efficiency service and product and will recommend you to others. My recent purchase was a 4 x 1 HDMI passive switch (press button switch) it works well with my Foxtel iQ3 box whereas other splitters that I tried did not work. Excellent thanks, product works well switching Foxtel to an outside TV. The 4 port HDMI Switcher works a dream I can now have my DVD player, Fetch TV and Apple TV all connected to the second HDMI port on my monitor and still be able to connect my video camera when I wish. It makes life so much easier at a small cost. As well as great delivery. Just wanting to thank you for the great service, and great product. Before buying the 2-Port HDMI Switch Box, I mistakenly bought a similar cheaper product on ebay. It did not work, so I looked at my options with the Cable Chick. Ordering was easy, postage was speedy, and item was well wrapped. Most importantly, item performed exactly as advertised, and my AV problem is solved. Thanks Cable Chick! I received my HDMI switch at 6.30am the day after I ordered it. It was easy to install and use. I couldnt be happier with the product and also with Cable Chick. It was my first purchase, but I will be back.